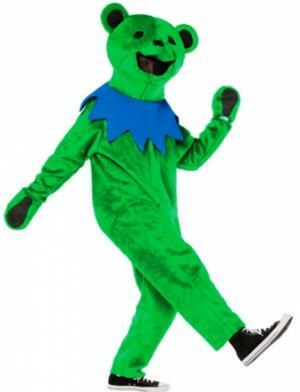 This Jerry bear costume is in green. You too can become a life size Grateful Dead dancing bear! Colorful green Jerry bear costume includes bear headpiece, green jumpsuit (Velcros in back) with attached hands, and a blue neck collar. Shoes are NOT included. Officially licensed Grateful Dead merchandise. Perfect for Halloween, and even to wear at a festival. Costumes come in 2 different sizes to fit most adults. Height - 55" - 60"
Waist - 27 - 29"
Chest - 29 - 34"
Height - 5'8" - 6'3"
Waist - 35 - 40"
Chest - 42 - 48"
Outseam - 41 - 46"